The Bethesda Big Train are proud to announce the first Big Train FanFest! The FanFest will contain great family fun, appearances by former Big Train players, giveaway items, photo opportunities with mascots Homer and Bunt, and information about the 2013 Big Train season, summer camps, picnics, and much more! It will take place at Shirley Povich Field from 5:30PM to 7:00PM on April 20th, 2013. Big Train FanFest will be immediately followed by the 2nd Annual Big Train Celebrity Softball Classic presented by Avenue Wealth at 7:15PM that evening at Povich Field! The event is a charitable venture featuring professional athletes from local teams (including the Washington Redskins) facing off against local and national media personalities for the second year in a row. 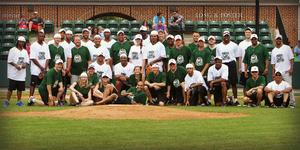 Both Big Train FanFest and the Big Train Celebrity Softball Classic will be featured on the same tickets that will go on sale to the general public at 10:00AM on March 15th, 2013. At that time, fans will also be able to see an updated list of athlete and media commitments for the Big Train Celebrity Softball Classic.